We see the predicament you are in. Your new sequin tote doesn’t exactly “go” with your fierce mobster costume, but the rule of modern life states that one does not leave the house without the big three: cellphone, keys, wallet. What’s a baddy babe like you to do tonight? Relax. Don’t fly off the handle and order hits on everyone you see. Just arrange for a box full of these magical accessories to mysteriously “fall off the back of a truck” and you can distribute them to your whole crew! 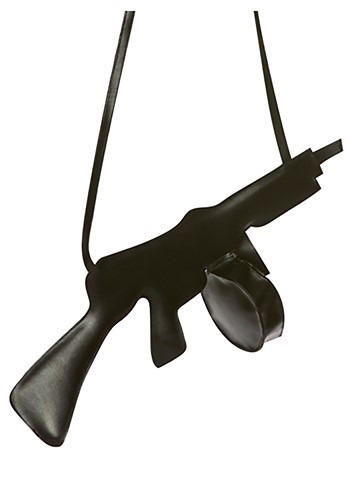 You’ll arrive at tonight’s soiree armed and dangerous with this Tommy Gun Purse (but also totally prepared). The circular "drum magazine" is the zippered compartment for all of your necessities. Your cover won’t be blown, but the costume competition will really be blown away! Very disappointed. For the money could have been bigger and arrived,bent, flat an out of shape!